After first denying the dumping of hazardous chemicals violated the law, the city of San Luis Obispo paid an $8,690 penalty in May for the illegal dumping at the city’s corporate yard. The California Department of Toxic Substances Control (DTSC), and other regulatory agencies, started to investigate the deliberate dumping of the chemicals following an exclusive CalCoastNews story on the incident. In Jan. 2011, Bud Nance, a manager with the city’s utilities department, told several subordinates to empty out cans of acetones, varnish, epoxy, paints and creosotes onto the yard’s asphalt parking lot near a wetlands area. After CalCoastNews broke the story, the city responded by claiming it was only five gallons of paint, that the deliberate dumping was limited to an area covered by asphalt and that the pouring out of paints to dry for disposal is an allowable action. But, photos and emails make it clear that it was much more than latex paint. One photo shows more than nine legible can labels; only one is latex paint. Other labels show epoxy, rust remover, stain and enamel paint. The DTSC tested soil samples in the area around the corporate yard a year after the illegal dumping and discovered creosote in the soil, according to an April 22 consent order. 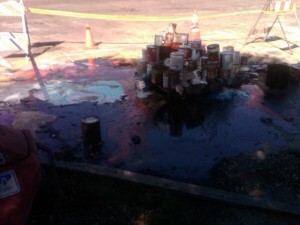 Following the illicit dumping, city and county officials tried to keep mum about the spill. A string of emails show some San Luis Obispo city employees attempting to downplay or hide the problem. Two weeks after the chemicals were poured out on the ground, city management asked San Luis Obispo Fire Department Hazardous Materials Coordinator Kerry Boyle, who also works with the county’s environmental health department, to inspect the site. Information from employees and dates on photos show the chemicals had been soaking into the ground for about two weeks before the city called the inspector. Boyle then supervised the cleanup, which should have required the removal of the chemicals by trained hazardous waste workers who should have disposed it as hazardous waste with proper manifesting. Instead, industrial kitty litter was poured on the spill and then the chemicals were trucked to the household dump area at Cold Canyon, in violation of the law, according to emails between the DTSC and Boyle. In an odd twist, the DTSC would have the county’s health services and inspector Boyle take over the investigation. In Feb. 2012, Boyle slapped the city with a notice of violation, Boyle then claimed city staff violated 16 laws regarding the city’s dumping, disposal and supervision of hazardous chemicals. In the end, the city and county agreed that the city would pay a fine and the county would drop all but two of the violations. Because of the agreement, the fine amount was kept under $10,000 and as such San Luis Obispo City Manager Katie Lichtig was able to pay the fine without informing the public or the city council of the agreement or the fine. So Kerry Boyle will only do his job when an outside agency calls him on the spot or points out his incompetence. What do we pay this character anyways and to do nothing? First he says there was no issue, then when someone from the outside (DTSC / EPA) determine their is an issue, Kerry runs to the front of the line a year later and says “WE HAVE A PROBLEM, WE HAVE A PROBLEM AND I HAVE IDENTIFIED IT”! So here is a question to anyone in the community. Have you ever been fined and/or chastised by this character? If so, since he blatantly unequally enforces the rule of law you can now make issue with any penalty he may have imposed upon you or your firm. Call an attorney and get your money back. If he comes out to your facility now, refuse to allow entry. No court of competent jurisdiction can issue a warrant based upon the dual standards Mr. Boyle has clearly demonstrated. I would say lets make him more ineffective than he already is, but how much more ineffective can he be? Now that is the question? What would the fine be for a private citizen who did the same thing as the City of San Luis Obispo did in this instance ? I bet a heck of a lot more and perhaps some jail time as well ? Well if Measure Y passes we know where the first $8960 of it will go to replace funds, the remainder will go to Christine Dietrick’s next raise as well as Katie Lichtig’s raise, but I’m sure they will come up will a cooler name for it, instead of raise it might just be administrative time off, unless Atascadero has the rights to that name, since they used it first. The remainder of Measure Y will go to benefits and pensions. CalPERS Update- Cities are going to have to pay higher contribution rates every year for the next 20 Years according to a recent vote by the Cal PERS Board. This is needed because of the Unfunded Liabilities. We just cannot afford to continue down this path of Excessive Salaries, Early 90% Retirements, and Costly Health Benefit Packages. How many more ” temporary” Tax Increases Can YOU Afford ? because of pensions and benefits. How many Tax and Rate Increases can you afford before You will be forced to move ? So, should we vote yes for Measure Y or no based upon the actions of Nance, Boyle and Faria – three stellar examples of government employees? So what happened to Bud Nance in all of this? Another promotion?